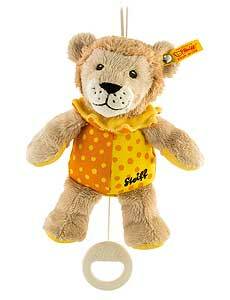 Steiff Leon Lion Music Box, made of beautiful soft beige, yellow and orange plush for a baby's delicate skin. his addorable Leon Lion Music Box has embroidered safety eyes and is machine washable. Removable music box, plays German melody.